All youth hunting opportunities (except the youth waterfowl hunting season) are available to any hunter who possesses a valid youth hunting license. All young hunters participating in youth hunts, regardless of age, must be accompanied by a nonhunting adult. A nonhunting adult is any person (a hunting license is not required) age 18 or older who accompanies the young hunter to and from the field and is present with the young hunter while the young hunter is engaged in hunting. The nonhunting adult may not possess any hunting implements. Accompany means to go along with another person while staying within a distance from the person that enables uninterrupted, unaided visual and auditory communications. Young hunters must be accompanied at all times by a nonhunting adult. No more than two youths per adult. Young hunters 17 years old and younger at the time they purchase their youth hunting license and a deer permit, and who are accompanied by a nonhunting adult may hunt.  Deer taken by young hunters during the youth deer gun season count toward the county and statewide bag limits.  All youths and nonhunting adults must wear hunter orange.  Camp Belden Wildlife Area is a controlled youth deer gun hunt and requires a special permit. Contact the District Three (Akron) office at (330) 644-2293 for details. Any hunters possessing a valid youth hunting license may hunt the following weekends: Oct. 21-22 and Oct. 28-29 for rabbit, pheasant, and all other legal game which is in season.  Quail may be taken only in those counties which are open to quail hunting .  Pheasant releases will occur for youth hunts on the following wildlife areas: Berlin, Caesar Creek, Camp Belden, Darke, Delaware, Grand River, Killdeer Plains, Oxbow Lake, Resthaven, Ringneck Ridge Wildlife Area (by permit only, find additional information at sanduskycountyparks.com), Rush Run, Spencer, Spring Valley, Tiffin River, Tri-Valley, and Charlemont Metro Park (Lorain County). Daily bag limits are the same as during the regular hunting season. The ODNR Division of Wildlife conducts several controlled deer hunts for young hunters. The dates and locations of the hunts vary from year to year. The application period for these hunts is June 1 through July 31, 2017. Hunters may apply online at wildohio.gov or by calling 1-866-703-1928 with a convenience fee. Two opportunities exist for young hunters to participate in the spring wild turkey hunting season. A youth wild turkey season will be offered Saturday and Sunday, April 21 and 22, 2018 immediately prior to the regular wild turkey season. 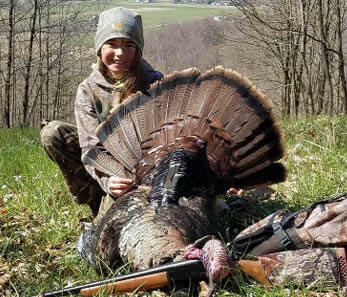 The season is open statewide EXCEPT for Lake La Su An which conducts a controlled youth hunt; contact the District Two (Findlay) office at (419) 424-5000 for details. Special youth wild turkey hunts will be held at Lake La Su An, Killbuck Marsh, and Mosquito Creek wildlife areas, and Paint Creek State Park during the regular spring wild turkey season. Any person interested in participating in these hunts should contact the District Two (Findlay) office at (419) 424-5000 for the La Su An hunts; the District Five (Xenia) at (937) 372-9261 for the Paint Creek hunt; and the District Three (Akron) at (330) 644-2293 for the Killbuck and Mosquito Creek hunts during March 2018. Please note that you must possess a controlled hunting permit acquired during the March drawing to hunt at any of these special youth wild turkey hunts.  Youth hunters may take two bearded turkeys during the youth season (one per day). Checking two wild turkeys fills the youth hunter’s bag limit for the remaining 2018 spring wild turkey season.  All rules and regulations for spring wild turkey season apply during the youth season.  Hunting hours for youth turkey season are 30 minutes before sunrise to sunset. New this year, federal regulations allow hunters 17 years old or younger to hunt waterfowl statewide (on public and private lands) on Saturday and Sunday, Oct. 7-8, 2017. All hunters 17 years old and younger must be accompanied by a nonhunting adult 18 years or older (no more than two youths per adult). Ducks, geese, and coots can be taken under bag limits established for the regular season. Young hunters (17 years old or younger) may apply for controlled youth waterfowl hunts. Go to wildohio.gov or call your nearest district office for youth waterfowl hunting opportunities.  This application period is June 1 through July 31, 2017. Hunters may apply at wildohio.gov, or by calling 1-800-703-1928 with a convenience fee.  Attend an in-person waterfowl drawing in August, which includes permits for the youth season.  Report to the wildlife area and register in-person the day of the hunt.